Idaho Attorney General Lawrence Wasden addresses a crowd of more than 60 in Moscow, Idaho on Tuesday, May 29, 2018, about Idaho’s open meetings and public records laws. The Idaho Open Meeting Law has no “dirty laundry” exception. That’s right – government board members who say they want to meet behind closed doors to avoid airing their “dirty laundry,” then come back smiling and agreeing in their public meetings are violating the open meeting law. 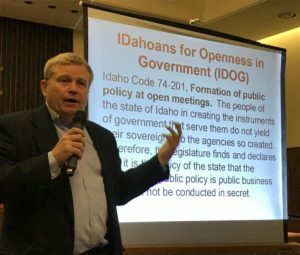 And believe it or not, the “dirty laundry” excuse and one other – holding a closed executive session to “collect our thoughts” – are the most common reasons the Idaho Attorney General’s office hears for why public boards wrongly think they’re entitled to conduct the public’s business in secret. And no, there’s also no open meeting law exception for board members to collect their thoughts. The Lewiston session was one of three North Idaho open government workshops held last week by Wasden and Idahoans for Openness in Government, as part of a continuing series of interactive educational presentations around the state that started back in 2004. It will continue next year with sessions in the Treasure Valley. Full disclosure here: I’m the president and co-founder of the nonprofit IDOG, and I also help lead these sessions. They’re about how to comply with Idaho’s open meeting and public records laws, and are aimed at reporters, government officials, lawyers and citizens alike. They’re also free, thanks to grant funding and generous local co-sponsors for each session. Last week, more than 100 people gathered at the Coeur d’Alene Resort, more than 50 at Lewis-Clark State College in Lewiston, and more than 60 at the federal building in Moscow for the workshops. There were people from newspaper and radio stations, cities and counties, school districts and fire districts, TV stations, colleges and universities, airport and port districts, online news outlets, state boards and more. There were city attorneys, local and state officials, lawyers, students and just plain interested folks. Many found themselves assigned parts in skits to act out the right ways – and the wrong ways – to go about following Idaho’s two key open government laws. There were lots of laughs. And by the end of the three-hour-plus sessions, everyone had learned something – including me. Highlighted at these sessions were new laws passed by the Legislature this year that will take effect July 1, and each of the changes has the effect of requiring more openness under either the public records law or the open meeting law. One change means that boards or commissions created by executive order of the governor now will fall under the Idaho Open Meeting Law. Another requires agencies to designate on their agenda all “action items” to be voted on during their meetings, and not to vote on any other items unless an emergency is declared. “Identifying as an action item does not mean you’re required to take action,” Kane noted. He said lawmakers were reacting to complaints from citizens that from the agendas, they assumed various items at public meetings were informational – but then votes were taken, before any chance for public input. “Things are in the law the way they are because someone did something,” Kane noted. Though some officials have expressed concerns about the new requirement, Kane said it shouldn’t be hard to comply with, and noted that entities including the state Board of Examiners already routinely separate their agendas into portions for action items and for information only. And another legislative change this year makes certain items in personnel files, including bonuses, severance packages, and vouchered or unvouchered expenses for which reimbursement is paid by a public agency, fully disclosable under the public records law. Social security and driver’s license numbers are exempted. Sen. Mary Souza, R-Coeur d’Alene, sponsored that new law and the custodian provision, and was recognized for it at the Coeur d’Alene workshop, where she was among the attendees. The sessions are light-hearted, but the subject matter is serious: The rights of the people to know what their government is doing. There’s more information online at IDOG’s website, www.openidaho.org.